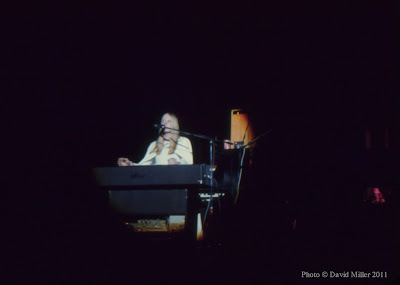 Rick Wakeman was born in Middlesex, England, in 1949. He had lessons on the piano as a child, and quickly displayed a high degree of musical talent. By his early teens he was regularly winning awards for his musicianship, and soon began to perform with local bands, playing with The Atlantic Blues, The Concords, Curdled Milk, The Green Dolphin Trio, and The Ronnie Smith Band. In 1968, he began to attend the Royal College of Music in London. 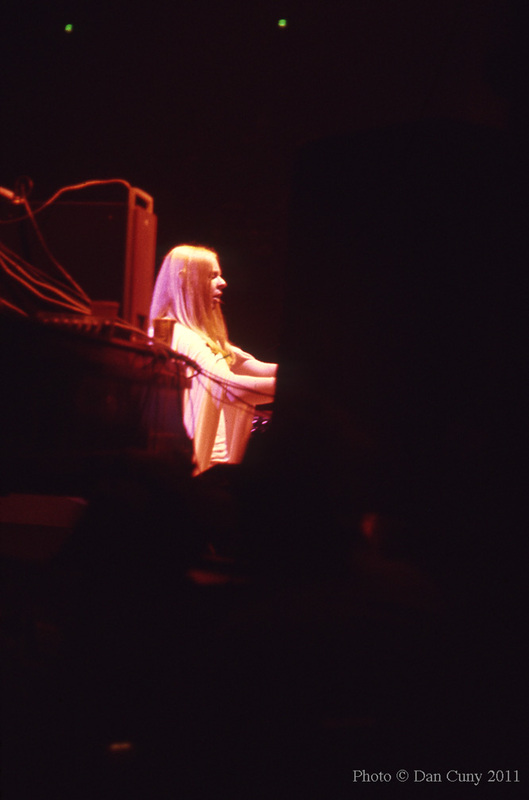 In 1969, Rick Wakeman chose to leave the Royal College of Music, and joined another band, The Spinning Wheel. He also began to work as a freelance musician at recording sessions. His services soon were in great demand, and during the next few years he played keyboards on recordings by David Bowie, Cat Stevens, Elton John, Mary Hopkin, Cilla Black, Lou Reed, Al Stewart, Ralph McTell, Harry Nilsson, Strawbs and many others. 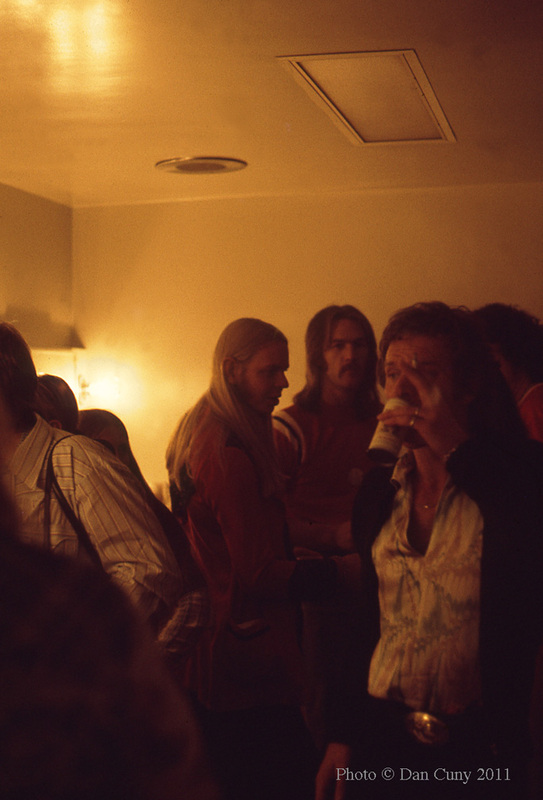 In 1970, after working on sessions for Dragonfly, the second album by Strawbs, he was asked to join the band. 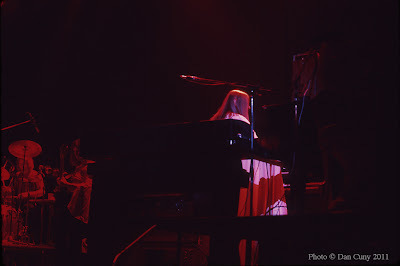 Rick Wakeman appeared on two more albums by Strawbs, Just a Collection of Antiques and Curios and From the Witchwood, and then, in August of 1971, he left the band to join Yes. 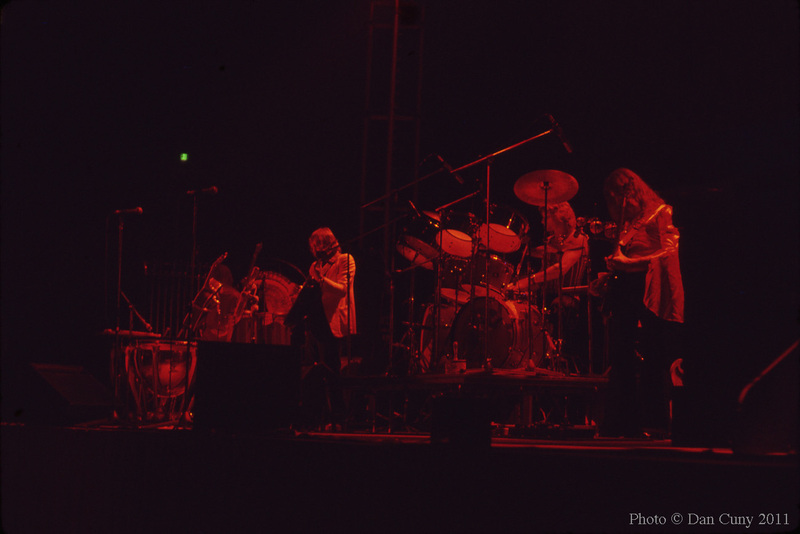 His extensive abilities helped Yes to move forward musically, allowing them to expand the range of expression in their sound. He played piano, organ, mellotron, and synthesizer on their next four albums: Fragile, Close to the Edge, Yessongs, and Tales from Topographic Oceans. 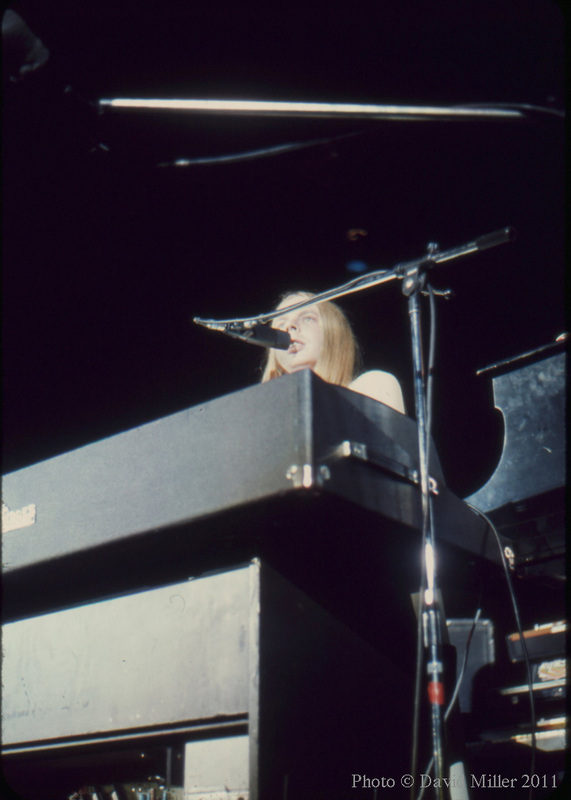 It was during his time with Yes that Rick Wakeman began to be seen as a major star in his own right. 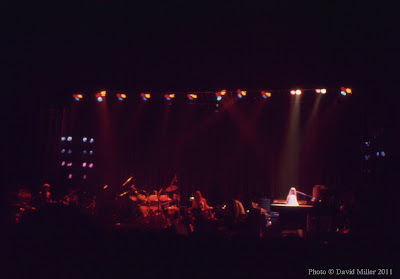 His extraordinary facility on different keyboards brought a response of universal praise, dazzling listeners and inspiring other musicians. 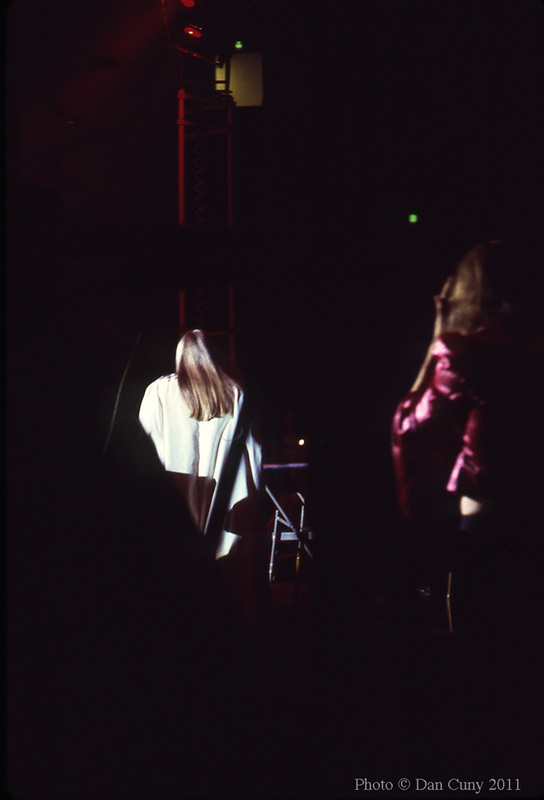 In addition, his long, flaxen hair, which flowed over his shoulders and down his back, and his friendly demeanor endeared him to audiences around the world. 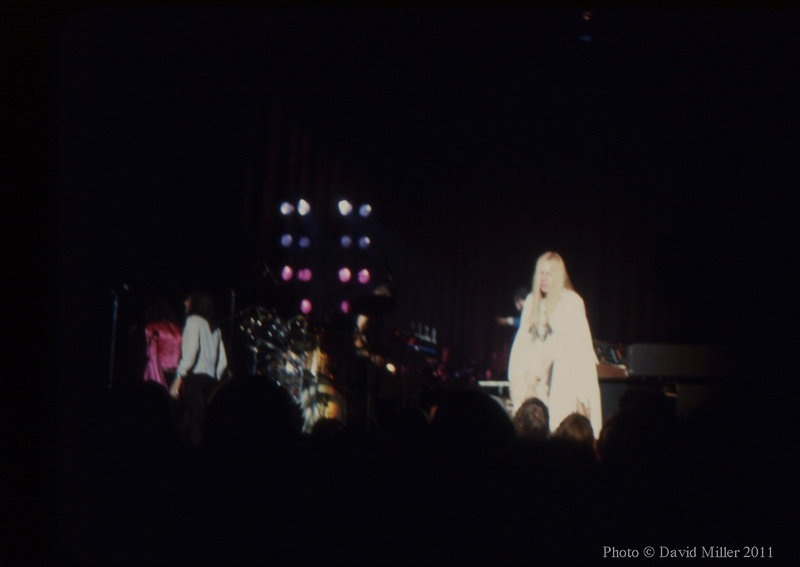 In 1973, he released the first album of his own music, The Six Wives of Henry VIII. It featured six pieces of music, each named for one of the wives of Henry VIII: "Catherine of Aragon," "Anne of Cleves," "Catherine Howard," "Jane Seymour," "Anne Boleyn," and "Catherine Parr." On January 18, 1974, Rick Wakeman gave a performance of Journey to the Centre of the Earth, a new composition derived from the famous novel by Jules Verne, at the Royal Festival Hall in London. 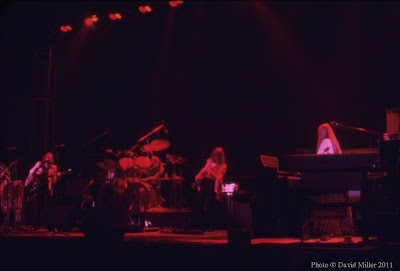 The keyboardist was joined by two vocalists, a guitarist, a bassist, and a drummer, as well as the London Symphony Orchestra and the English Chamber Choir. David Hemmings provided the narration. The entire performance was recorded, and was released as Rick Wakeman's second album later that year. 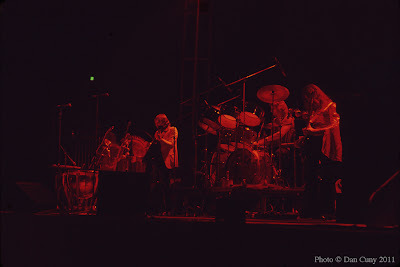 In May of 1974, after openly expressing his unhappiness with the music of Tales from Topographic Oceans, he resigned from Yes, intending to pursue a future under his own name. 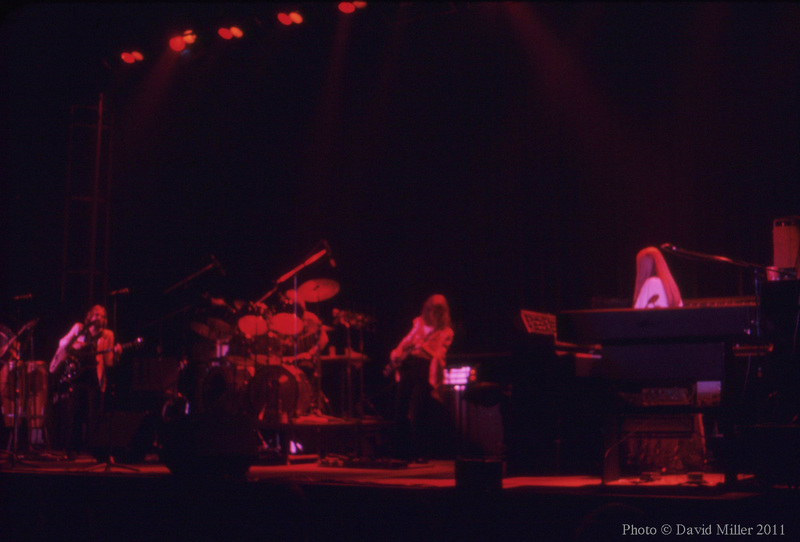 (Although he returned to Yes in 1976.) Later in 1974 he set out on a worldwide tour with Journey to the Centre of the Earth, offering a performance in San Francisco on the evening of September 28. By that time Rick Wakeman had attained the highest peak of fame and musicality, having gone from being an unknown musician to being a superstar of prog rock, all in a period of several years. 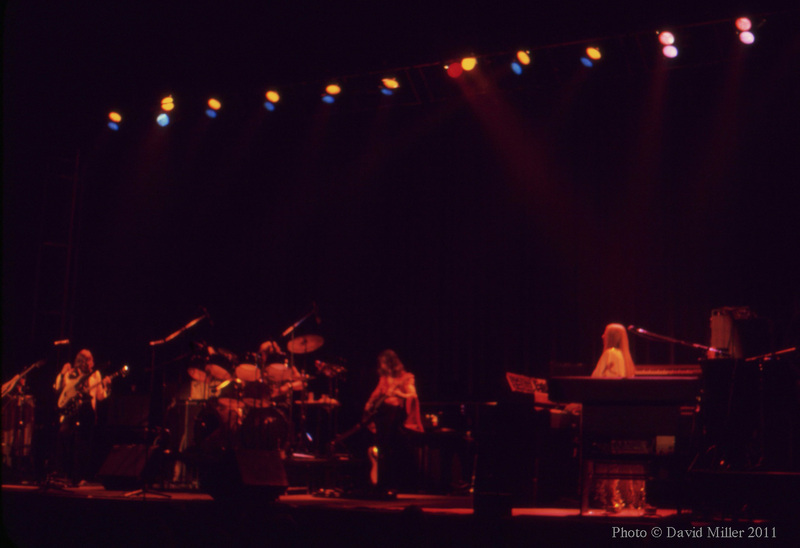 David: When my friends and I saw Rick Wakeman perform his epic Journey to the Centre of the Earth at the San Francisco Civic Center, it was more of an event than a regular concert. 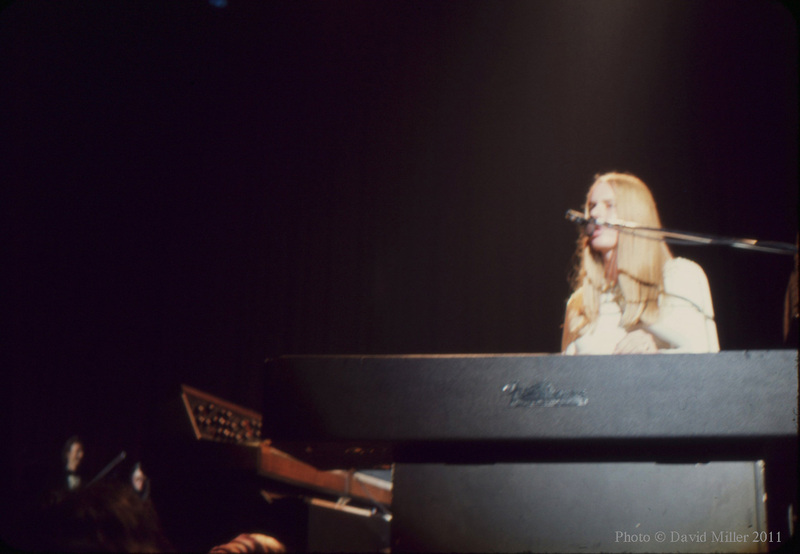 Rick Wakeman had achieved a status playing keyboards that was usually given to guitarists like Eric Clapton and Jimmy Page. There was no opening act. 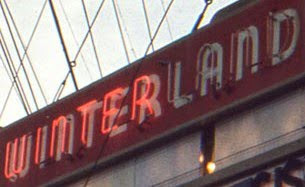 Unlike Winterland or the Cow Palace, it was a seated venue. 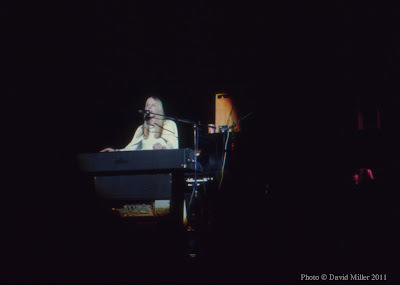 When the lights dimmed, a spotlight followed Rick Wakeman across the stage to his keyboards. 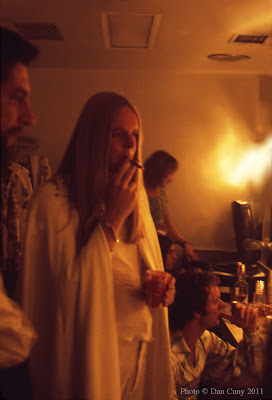 He was wearing the same long white robe that he wore as a member of Yes. He immediately started the concert with a piece from his first solo album, The Six Wives of Henry VIII. It was familiar to the audience and received loud applause. He would talk to the audience between songs. At one point he said that touring across the country meant having to sit in hotel rooms and watch TV. 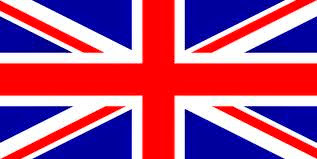 He explained that he saw a lot of American TV shows and commercials that were not shown in England. So to pass the time, he put together a piece of music that was made up of commercial jingles strung together. That gave the show some levity. 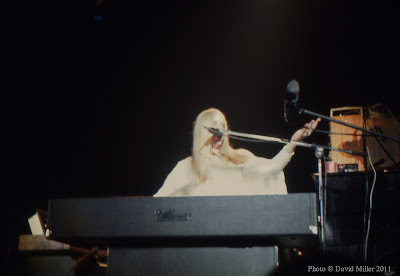 I enjoyed the sense of humor that Wakeman displayed on his albums and in concert. 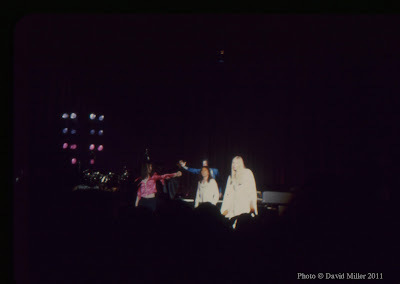 The show took a turn when a spotlight focused on a man seated in a big chair on the stage. He announced in a booming voice, "Journey to the Centre of the Earth!" 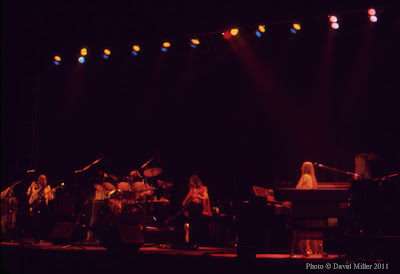 There was an orchestra and a chorus, but not as large as on the live album. It was interesting to see two male lead singers. 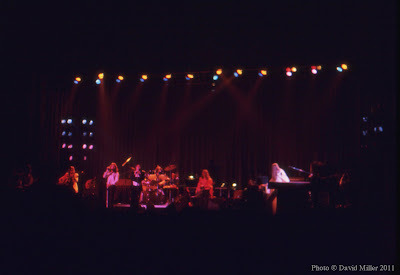 There were other musicians on the stage, but Wakeman was generally in the spotlight. During the concert I saw that people were walking up to the stage and taking photos. I left my seat and walked to the front of the stage, and took a few closeups of Wakeman. He was very difficult to photograph, buried behind a fortress of keyboards. I did get a chance to photograph him as he spoke into a microphone. 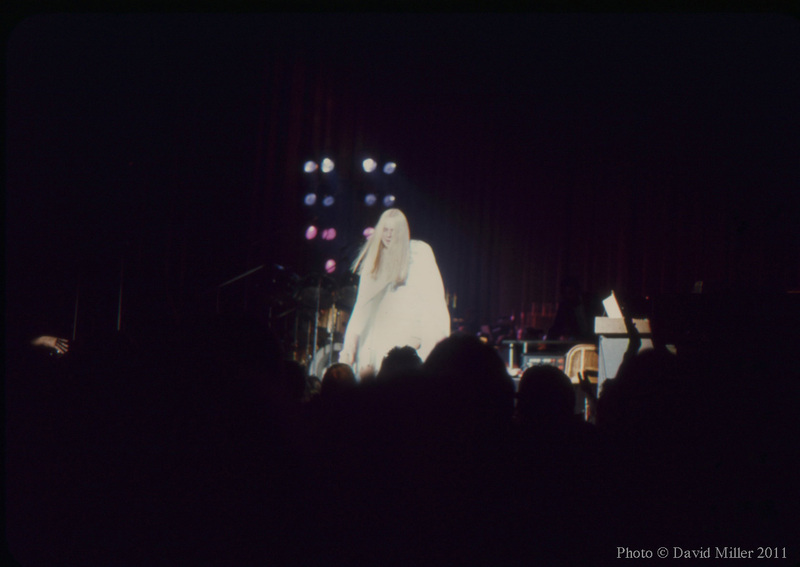 The bright spotlights reflected off his pale complexion and his shiny white outfit, so he was almost washed out in the photos. At some point during the performance of Journey to the Centre of the Earth, I became aware of something moving to the left of the stage. 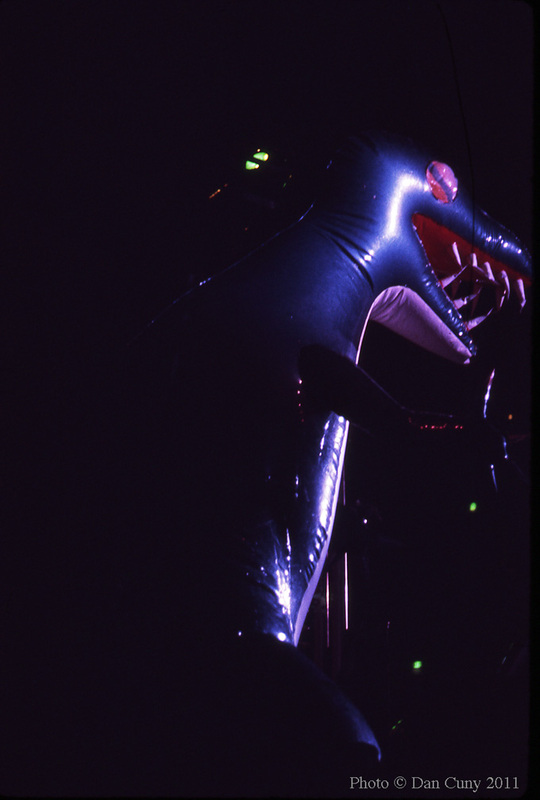 It turned out to be a dinosaur that was being inflated like a balloon. It towered over the musicians and gave another bit of levity to the show. We waited outside after the show to meet Rick Wakeman. He finally appeared with an entourage, which included my friend, Dan Cuny! After I was over that shock, I got to speak with Rick Wakeman. He was very friendly and easy to talk to. I am a fan of early Strawbs music, and I asked him, "Whatever happened to Tony Hooper?" He told me that Tony Hooper was running a record company or production company. I don't recall his exact answer, but I was glad that he was willing to respond to my question and give me an autograph. 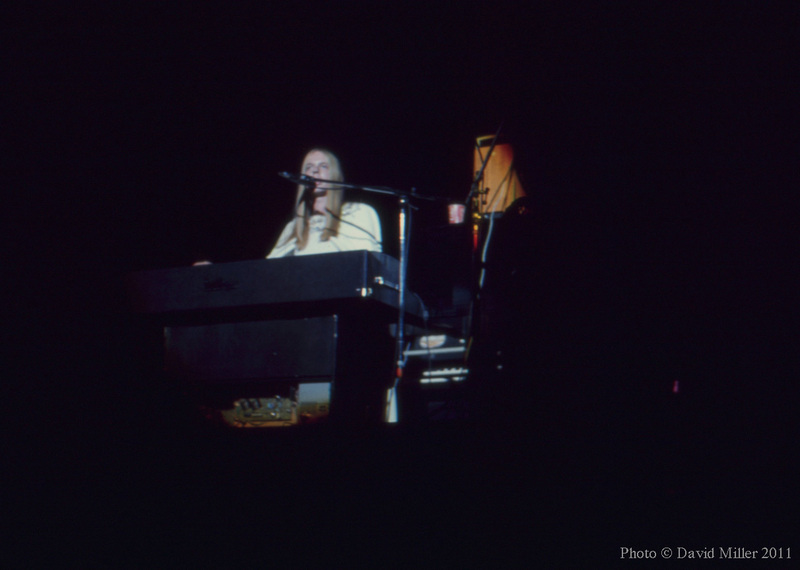 Rick Wakeman was a great showman, but also very down-to-earth. 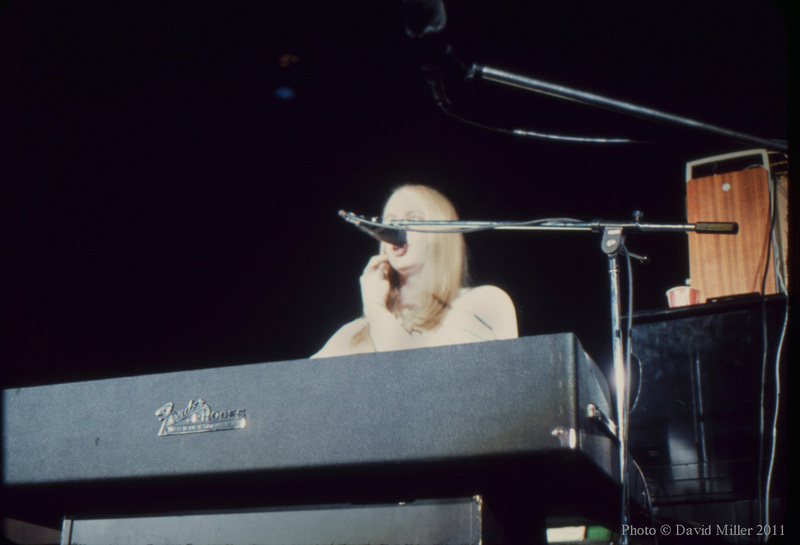 Gary: I liked Rick Wakeman's work, mostly early on with The Six Wives of Henry VIII. I remember reading, in Melody Maker, his response to a critical review. He said that he went back and listened to the album again after the bad review, and was generally satisfied with what he had done. He seemed very hurt by the review, yet he stood his ground. Rick Wakeman was a brilliant keyboard player. I liked his early work a lot (Just a Collection of Antiques and Curios and From the Witchwood by Strawbs, and Fragile and Close to the Edge by Yes, were all amazing recordings, as well as his session work with Cat Stevens and others) and I was looking forward to seeing him on his own in San Francisco. This was right around the release of the Journey to the Centre of the Earth LP, which I didn't like as much as The Six Wives of Henry VIII, but I was still interested. 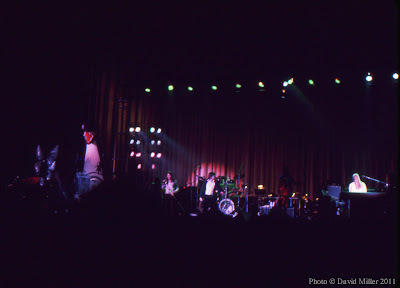 He had a big rock band with orchestra, which was dynamic and impressive in scope. I don't remember much of the music. They played mostly from those two albums, with the new album in its entirety being the highlight of the show. Dan: My recollections are going to be different from those of my good friends, Michael, David, and Gary, as I went to this concert with another close friend, Greg Copeland. 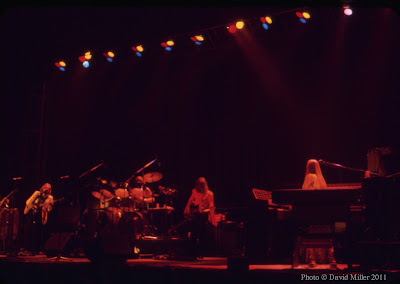 Greg and I had very good floor seats for the show, and when we arrived and found our seats, I told Greg that I needed to use the restroom, which was on the side of the venue. As I was heading toward the restroom, I passed a door that led to backstage. I turned the handle of the door, and to my surprise, it was unlocked, with no one guarding the entrance. So, like any good concert fan, I walked in and found myself backstage! I was just wandering around with my camera hanging from my neck, about twenty minutes before show time, when one of the guards came up to me and asked to see my backstage pass. He suddenly was distracted for a moment, so I turned around and saw, right there in front of me, a violin case with a pass on it. I grabbed the pass and pressed it to my chest. I had made it, I was backstage at a show for the first time. Nervous as heck, I crept onto the side of the stage and saw my friend Greg in the audience. I waved at him, and he looked at me with an expression of "Oh, my God!!! How did you do that?" I think he was upset that he wasn't with me backstage, but I couldn't think of how to get him in, too, as there now was a guard at the door. The lights dimmed, and I found that being on the side of the stage isn't the best place to take photos, especially when there's an orchestra and tons of equipment in front of you. This wasn't my most productive show to photograph, but the music was outstanding. Halfway through the concert there was an intermission in which the band took a break, and I followed the band into the dressing room and had a great time talking to one of the singers, who I thought was Gary Pickford-Hopkins, but wasn't certain. I can still remember that when all of the band members were walking back to the stage, I was standing on the side as the band started the second half, and the singer almost missed his cue because we were talking. 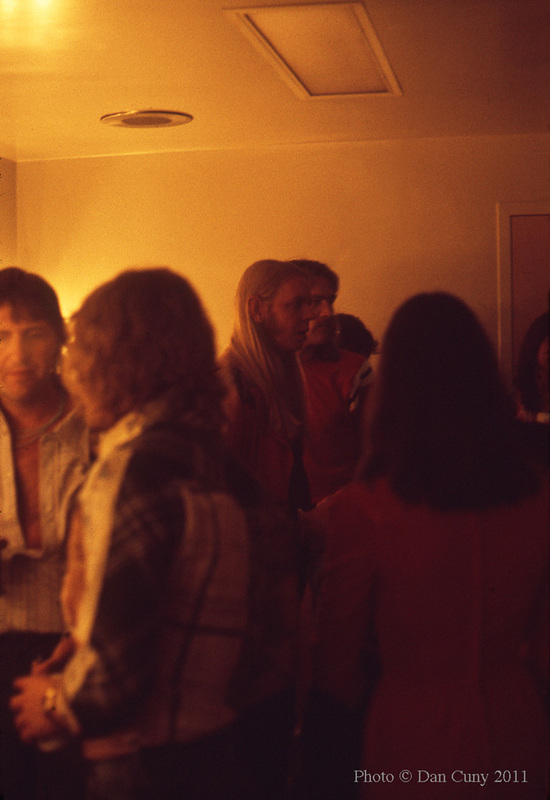 When the show ended, I had the opportunity of hanging out with the band afterward, talking to many of the band members and taking a few photos backstage, which was fun to do. 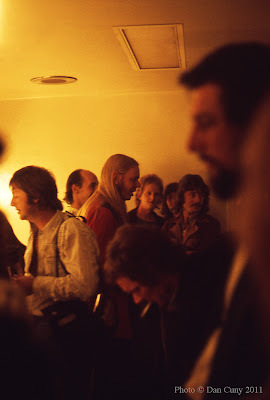 Then it was time to leave, and I got to walk with the band out of the stage door, where I saw my good friends waiting to get autographs from Rick Wakeman and the other band members. I stopped and talked to them for a moment, but then had to explain to my other friend, Greg, what had happened. I really liked Rick Wakeman's music, and this show was outstanding, with the orchestra, singers, and his brilliant keyboard work. It was something that I'll never forget. Michael: For some reason, my memories of this concert are not nearly as distinct as my memories of other concerts that we attended in those days, but as can be seen from the photographs, it was an impressive performance. Prog rock was in its full glory at that time, and Rick Wakeman himself had become quite a star. 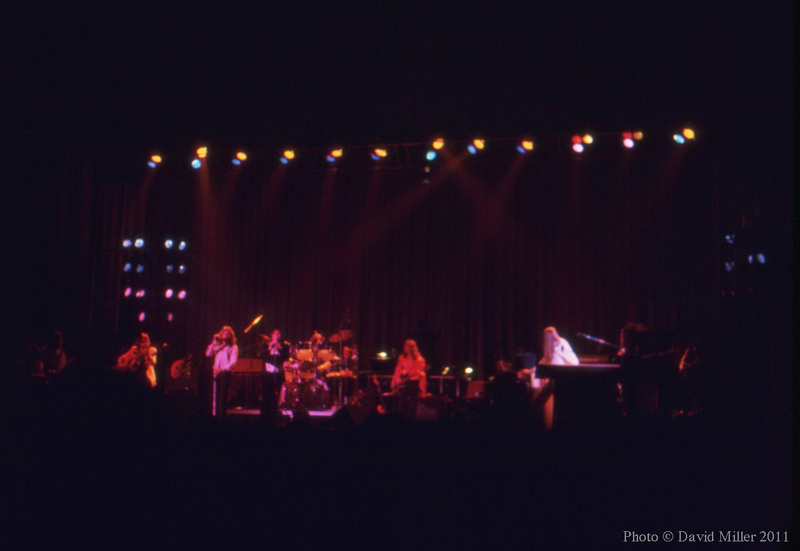 He was not afraid to think big and take chances, probably because he knew that his broad talent would enable him to follow through, and he had a flair for combining rock'n'roll with symphonic music. After the concert was over, we headed outside to wait at the stage door with a handful of other fans. 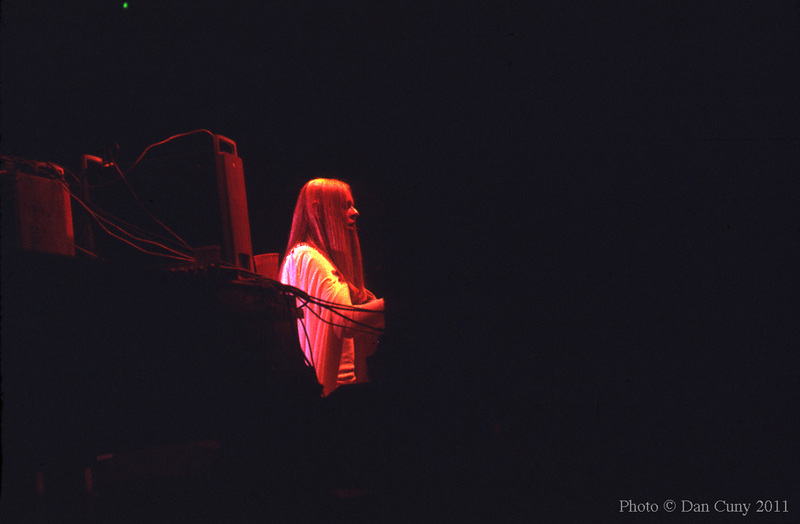 We were able to meet Rick Wakeman when he came out. He was charming and outgoing (and quite tall), signing autographs and chatting freely with everyone. When someone asked him how he kept his hair looking so good, he shrugged and replied, "Oh, there's a guy in London who takes care of it for me." In spite of his fame, he came across as a "nice bloke." References here say Rick WAS a great keyboard player. Well he IS still alive and he is STILL a great keyboard player.